Many AAC language systems contain robust vocabularies, including core words. Yet how easily & how rapidly can an AAC device user access such high frequency words & combine them with fringe vocabulary to generate spontaneous, novel, meaningful language? Importantly, how independent is this process? In order to produce spoken or written language, or even to read aloud, those who rely upon AAC need to be able to locate the particular words they want to state, easily & quickly. Where are the words stored & how can they be found? The pathways that lead to individual words are known as the 'navigation' system. There are only 3 ways of representing language by way of symbols, & each places different structural demands upon cognition & navigation. The orthographic system, namely combining letters to form words, is a learned, automatic process in terms of hand-written language. Similarly, keyboard generated text is primarily automatic, especially for those who can touch-type. When typists are presented with a non-Qwerty keyboard however, such as the Dvorak layout, their speed & accuracy vanish. This is due to their reliance upon established motor plans to automatically select & combine letters from known, static locations. For literate adults who rely on AAC for communication, through a degenerative condition or an acquired injury, using spelling & word prediction is familiar & comfortable. There are no navigation issues as all language can be generated from the one keyboard or Qwerty home page. Yet their ability to produce language quickly may be compromised by physical or cognitive limitations. Younger AAC users with emergent literacy may access spelling & word prediction in with a blend of symbolic representation. Some older non-verbal people might also use a combination if this speeds up their rate of communication while guaranteeing precision of expression. The majority of those who depend upon AAC to get their message across employ a symbol-based approach. Focussing on the more common single-meaning single-symbol method of depicting words, it is apparent that there are structural problems in terms of navigation. Even a large low-tech communication board will not offer quite enough core vocabulary to meet the language needs of young AAC users. The only navigation option away from the limited, finite number of locations is to attach a smaller flipchart with additional fringe words. PODD books contain many pages that can pose a navigation challenge to the user. This is frequently side-stepped by the services of a trained communication partner or conductor, with subsequent diminished user-independence. Harking back to earlier digital devices, modern static systems like the QuickTalker continue to pose navigation-strain for a user due to the multiple levels & need to change symbol overlays, again often affecting independent choice of words. Real language is composed of individual words. If an AAC system attempts to speed up language generation by using phrases, either wholly or partially, then this not only compromises spontaneous, novel utterances, it also makes navigation difficult. For a literate user the labels on a key or button inevitably become shortened abbreviations, almost meaningless. For illiterate users they are tasked with relying on a text label they cannot decipher, or a symbol that is somehow supposed to represent the entire phrase. Phrases tend to proliferate in number necessitating multiple pages & categorisation difficulties as each phrase is complex in meaning. This equals a severe memory strain. Dynamic display devices built around single meaning symbols can also give rise to navigational difficulties. Although careful selection of core, or high-frequency, words on the Home Page of a system can provide an excellent start, there will come a moment in time when an expressive device user will demand immediate access to more sophisticated language. The typical vocabulary of a child between the ages of two & three expands rapidly as more & more fringe words are learnt. However, their language also deepens in complexity as tense, grammar & basic morphology all come into play. As the functional range of communication increases, so does the need for correct core words. This causes a problem for users of single-meaning symbol systems since the core words on their Home Page are in fact only stem-words, while even the largest displays tend to contain around a maximum of 100 words. In order to say exactly what they want to say, in a novel & spontaneous manner they must commence a quest for the words they need on other pages. So, what begins as being a discernible Home Page can become more of a starting page, in reality. The hunt for core can develop into a challenging task as prime words are often positioned on multiple pages, in different spatial locations, interrupting natural development of consistent access motor plans. The words within a language are categorised by the parts of speech. Many single-meaning symbol systems struggle to abide by this concept as they give rise to what is termed a "page-based" approach. As language demands develop, users face up to thousands of pages, literally, containing vocabulary which is a mix of core & fringe. Travelling between pages can become a navigational nightmare as the considerable number involved exist in a 3-Dimensional web. The spatial memory load of this seeking process can be huge, especially for someone already branded with intellectual disability. This system must be well planned out and continuously maintained in order for the person to find the words they want, but the level of complexity can become overwhelming. 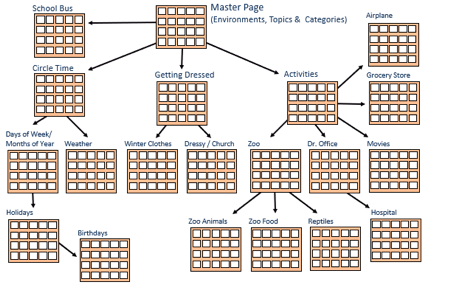 The number of pages massively increases proportionately to the number of locations being used in the Template Page…the smaller the grid the more pages required to contain even basic functional vocabulary. The navigational pathways are more complicated as there are fewer decision nodes. This might appear to make it easier to make a decision, but any decision will not suffice. The user cannot make informed decisions, because they are not provided with consistent rules of selection. Pathways are shared at initial stages by many different types of words, preventing the establishment of patterns of selection. Furthermore, in a single-symbol meaning, single-word (or phrase) approach, there are several inherent difficulties. All symbols, images or pictures give rise to multiple meanings in the mind. This is termed “polysemy” in linguistics. Therefore, in a single-symbol, single-word strategy each symbol has to be taught as unique in meaning. The conundrum intensifies when even supposedly concrete representations of nouns (fringe) can be re-interpreted to provide quite different meanings. Core vocabulary tends to be notional or abstract in meaning & often symbolic representation is arbitrary in its usefulness to an AAC user. No pictorial symbol can begin to depict a word like “that”. Thus, the effectiveness of the cue, or assist, to the user is negligible. As every phrase & sentence we ever compose is primarily made up of core words (80%) irrespective of activity or environment, it is crucial that AAC device users constantly have core vocabulary at their fingertips. Minspeak™ is the third method of representing spoken language symbolically. It uses a process called “semantic compaction” whereby words are only generated once symbols are placed in specific sequences. There is effectively only one page in a Minspeak system, a true Home Page. It is populated by one finite set of symbols that never change in appearance & most importantly never alter location. This allows a user to access thousands of words, along with all of the core, within mostly two to three selections. Minspeak embraces the concept of symbols having multiple meanings by re-using the same symbols time & time again, but in different combinations. This permits patterns of selection to develop naturally, according to the parts of speech. In due course, practice & repetition give rise to a unique motor plan of sequenced symbols that generates specific words.Minspeak, then, avoids all of the above navigational challenges posed by any single-symbol single-meaning AAC system, whether it be low or high-tech. It is a consistent, rule driven approach that is both teachable & learnable in the exact same way as language generally. *See the navigational maze document in our resources page. 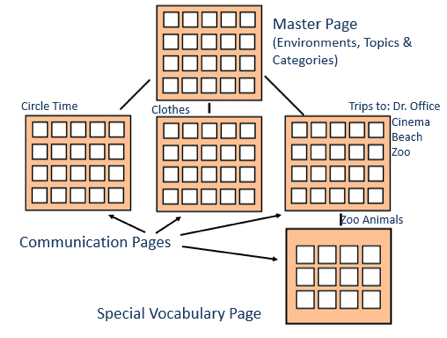 This will explain the structural difficulties in a single meaning picture system in more detail & in particular when it comes to classroom implementation.